I've come to the conclusion that I am a magpie. If it glitters, I want it. If it's sparkly, I need it. Sequins, studs, and spikes. I'm obsessed. Even now, I have rainbow glitter nail polish on my fingers and sparkly turquoise polish on my toes. I have a pair of black leather boots with spikes up the back en route to my apartment as I type. I just can't resist a bit of flash. This mild...ahem...obsession doesn't stop with clothes and accessories. If I could, I would have glittering chandeliers in every room in my house. I would wallpaper my house in glitter. I would only eat beautiful, colorful things. Macarons? Check. Marshmallows? Definitely. 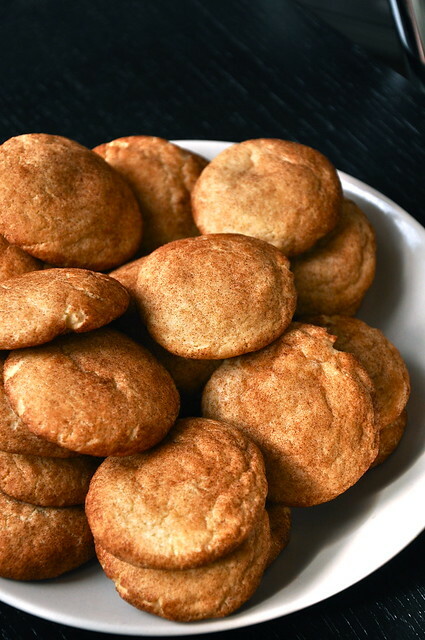 And snickerdoodles? Absolutely. 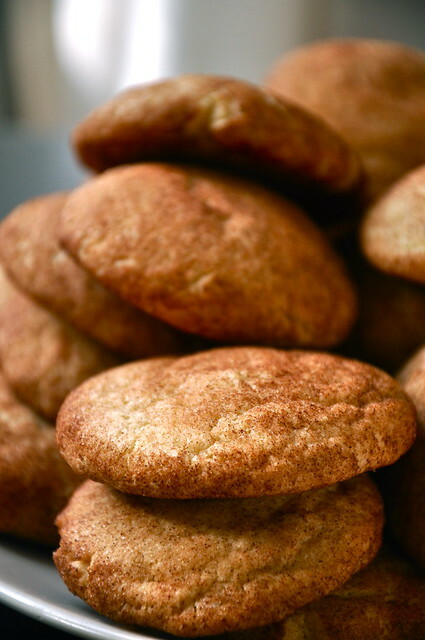 Pulling a warm and fragrant batch of snickerdoodles out of the oven is a truly sensory experience. I mean, you make a batch and try not to become entranced by their sweet cinnamon scent and lovely, subtle shimmer. 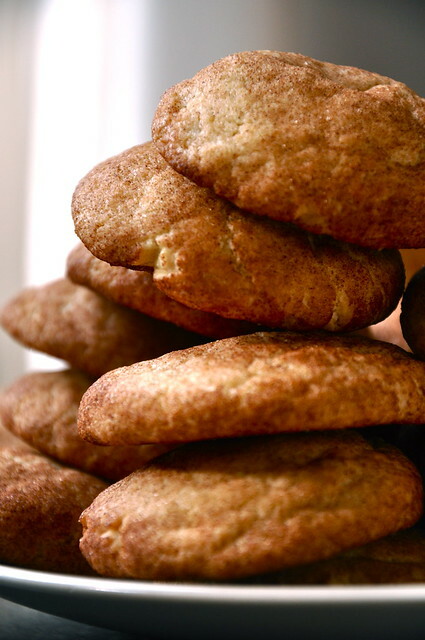 Not to mention, snickerdoodles are pillowy soft and wonderfully moreish. Once a batch is made, it's nearly impossible not to gobble it down in a split second. Preheat oven to 400. Line two baking sheets with parchment paper. In a medium bowl, whisk together flour, baking powder, and salt. In the bowl of a stand mixer fitted with paddle attachment, cream together butter and 1 1/2 cups sugar until light and fluffy, about 2 minutes. Add eggs, one at a time, and beat until combined. Beat in vanilla extract. Slowly add flour mixture and beat until just combined. Do not over-mix. In a small bowl, mix remaining 1/4 cup sugar and cinnamon together. 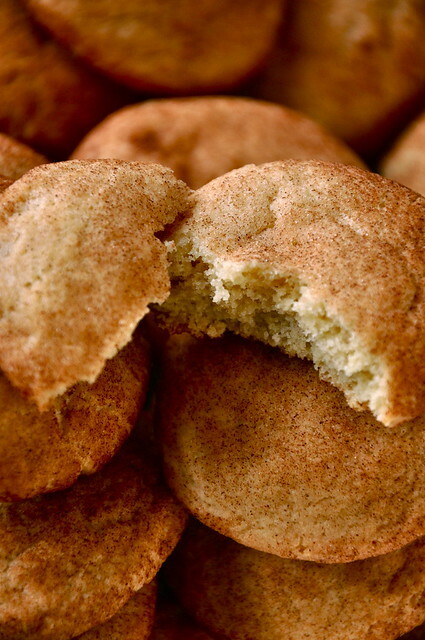 Using a small ice cream scoop, scoop out balls of dough and roll in cinnamon sugar mixture. Place on baking sheet, pressing down each ball with back of hand to flatten. Bake for 10 minutes, rotating halfway through. Let cool on a wire rack.